The Future of Philly event series strives to bring together partners and influencers in the different pillars of Philadelphia culture to produce content curated events and conversations around the Future of Philly. The purpose is to showcase the entrepreneurial and creative thinking found here and see how it can drive innovation in other industries to better our community. 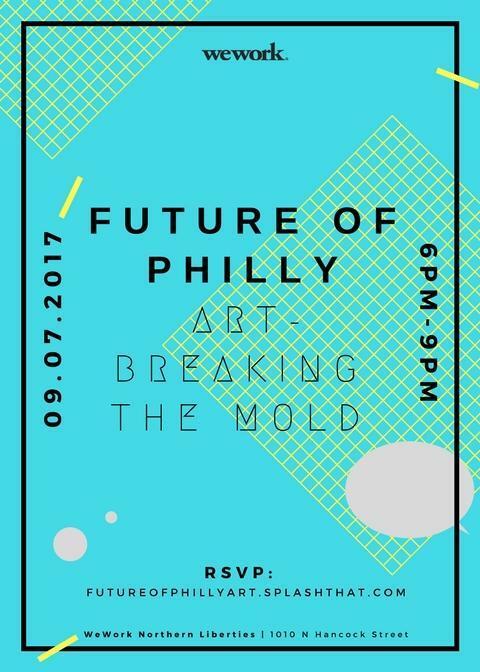 Future of Philly-Art will look at the unique intersection of Philadelphia’s long-standing practice of the arts based in academia and programs like Mural Arts and Percent for Art which have contributed to the growth of one of the largest public works collections in the United States. Sign in, grab a cocktail and help yourself to snacks. There will be a live mural painting by NDA Streetart as well as local artists works displayed throughout the venue. Meet Anita Shannon, Director of Community and our panel of art professionals. Join us as we highlight the arts community and the shifting landscape of arts in Philadelphia. There will be a Q&A at the end of the discussion. Get to know the Philadelphia Arts Community and WeWork!